The International Society for Technology in Education (ISTE) has established a new Special Interest Group focused on stereoscopic 3D in education and the group is now know under the name SIG3D. 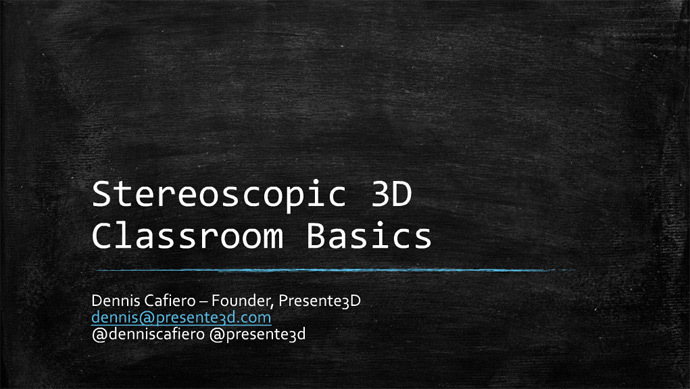 The SIG3D is an ISTE Special Interest Group intended for educators, researchers, educational technology developers, instructional technology innovators and others interested in educational stereoscopic 3D. The new SIG3D group’s aim is to improve learning and teaching through communication and collaboration between its members, providing professional development and resources for the effective implementation of educational stereoscopic 3D technologies as well as showcasing high-quality applications, pertinent research and instructional best practices. All this sounds as a good news for actively implementing various stereoscopic 3D technologies into the education process making it more interesting for the students as well as making it easier and giving more tools to the teachers to make their lessons more engaging and effective. The potential is there especially considering it is becoming harder and harder to keep the attention of the students with the traditional teaching techniques nowadays, so bringing new technology into play is a great opportunity and stereoscopic 3D can help a lot in classes if properly implemented and used. So the formation of SIG3D by ISTE is something worth keeping an eye on if you are into the educational segment and are interested in stereoscopic 3D technology.